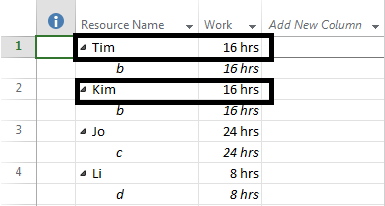 Project 2013 – Work hours showing as 0 in resource usage view for assigned resources!! There are instances when we see that even though resources are assigned on the tasks, yet in Resource Usage or Task Usage Views you see 0 hrs. assigned to those resource. 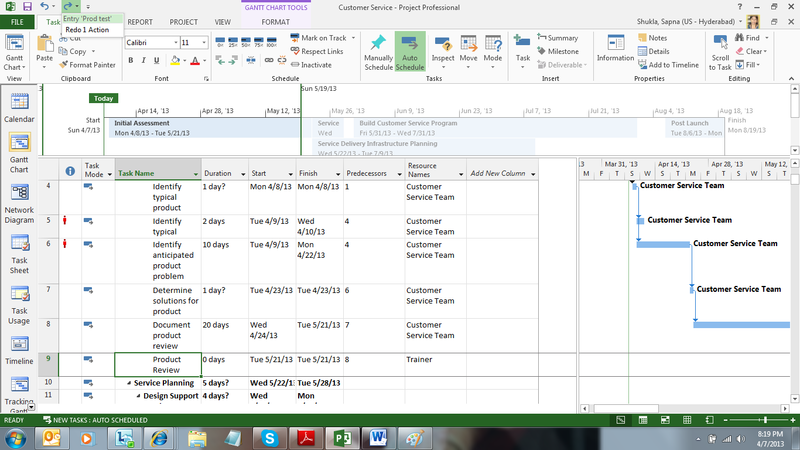 Refer to the snapshot below, even though resources are assigned yet in Resource Usage their Work Hours is shown as 0. Workaround : Turn on the Calculation Mode after each edits by -> File -> Options -> Schedule -> Calculate Project after each edit – turn it ON. This will fix the above problem. Well, all products of MS have this wonderful feature of do-undo, yet in 2013 they have added new icons for this, which doesn’t only do-undo but intelligently also displays what all you have added and from list of items which things you specifically want to undo-redo. 1) changed duration of a task from 1d to 10d (i.e. I added 10 to duration). 2) Similarly I added 2d and 20d to some other tasks. 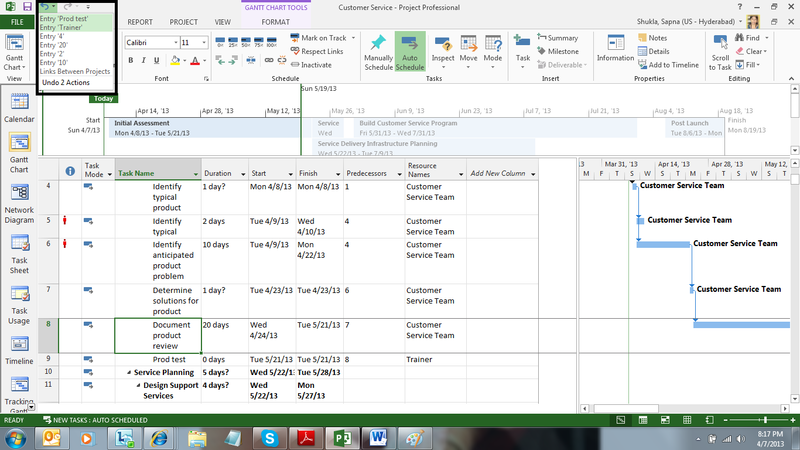 3) I added a link to a task and made task id 4 as its predecessor. 5) I added a resource “trainer” to one of the task. I simply loved this feature. I will be posting more on new features…keep watching.